Are you guys ready for a love filled post? ♥ I know I am! This day being so special for me, i wanted to post something that would go well with the mood. 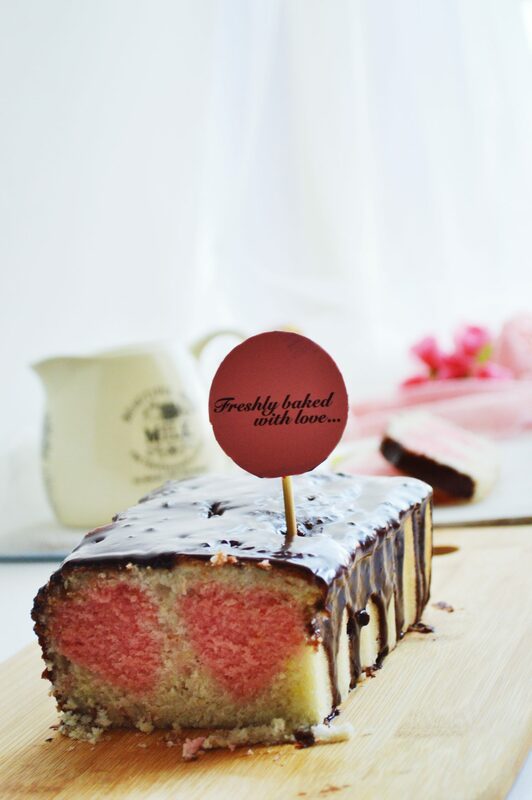 And i couldn’t think of anything more apt than this hidden heart cake. Don’t this cake just make you want to go…awwww. 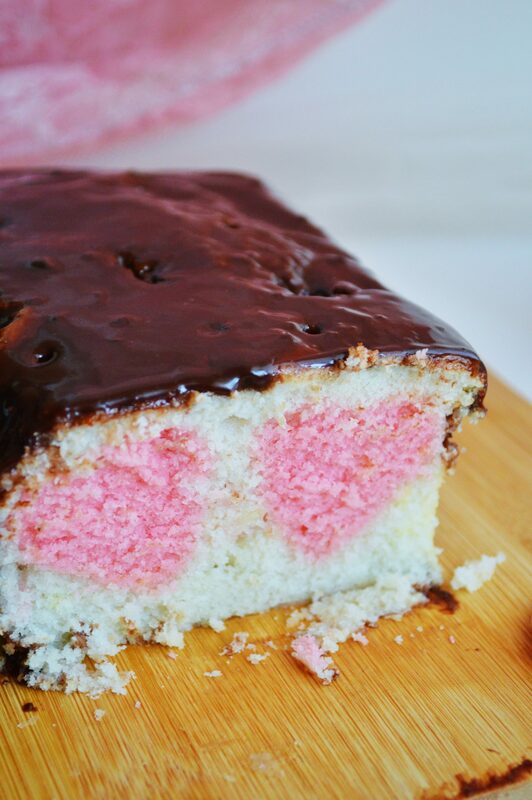 This cake really has a heart. 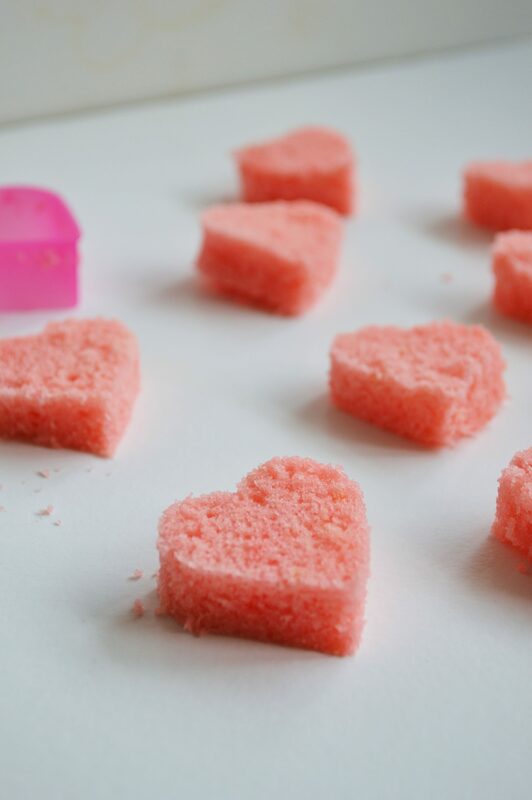 Cut or bite into one to see how much love went into them. The best part is that they are surprisingly simple to make. 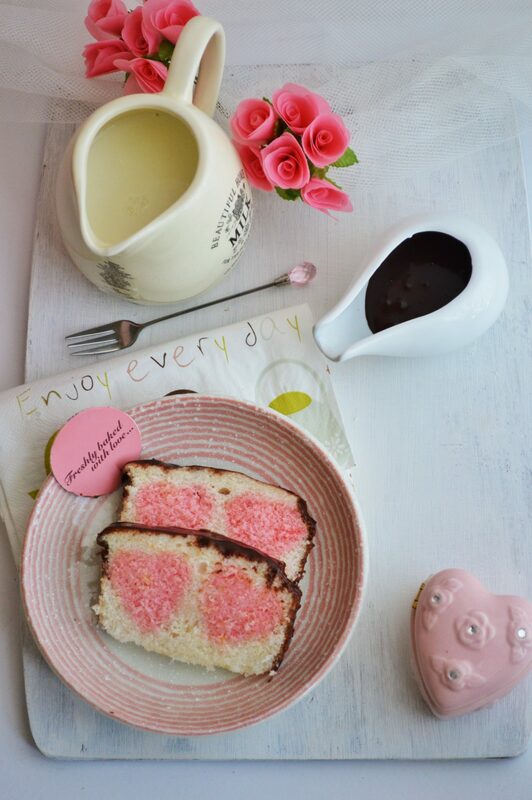 The white cake with a very cute pink heart inside and a delicious chocolate ganache on top makes a sweet and simple treat fit for just any special day celebration. And if your sweetheart happens to be a chocolate fan, you could just as easily bake your heart into some chocolate cake batter. 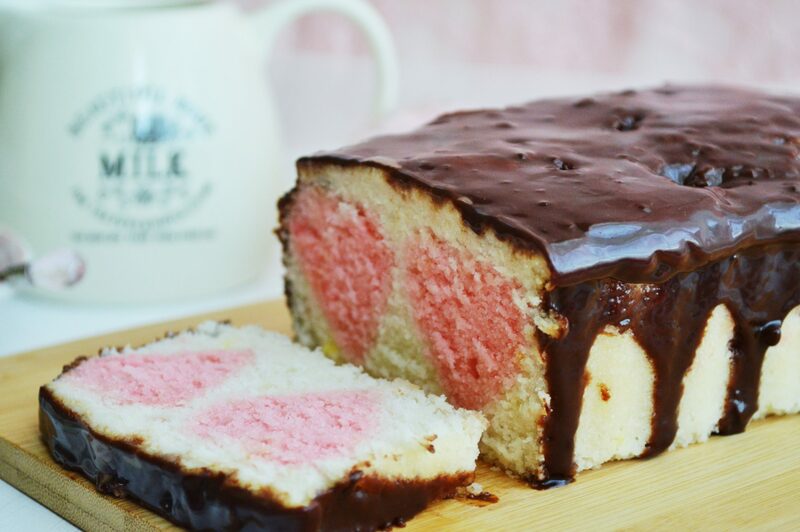 But i think the pink cake vs. white cake made all the difference in this. My sweetheart loved this beauty. I am sure all of your loved ones will love this too. Do try making it and enjoy! 1. 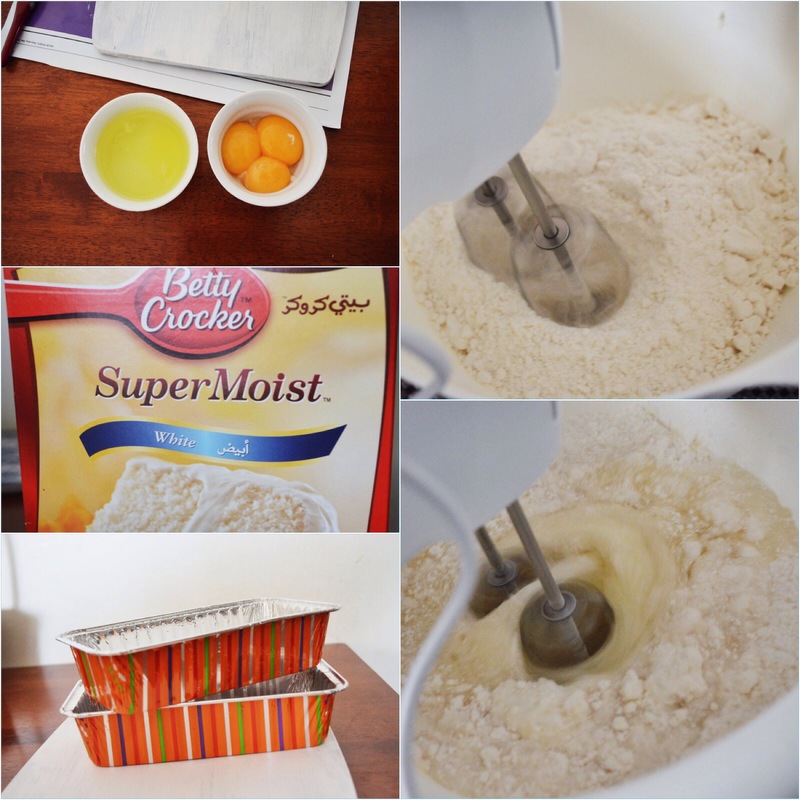 Mix up the white cake ingredients according to package directions. 2. Take out 1/3rd of the batter out and mix in 3-4 drops of red food color to it. 3. Bake it in a well greased 7×3-inch loaf pan. This might take a little less time than instructed. 4. Remove from pan and let cool. Cut the cake into slices. Cut heart shapes from slices. 5. 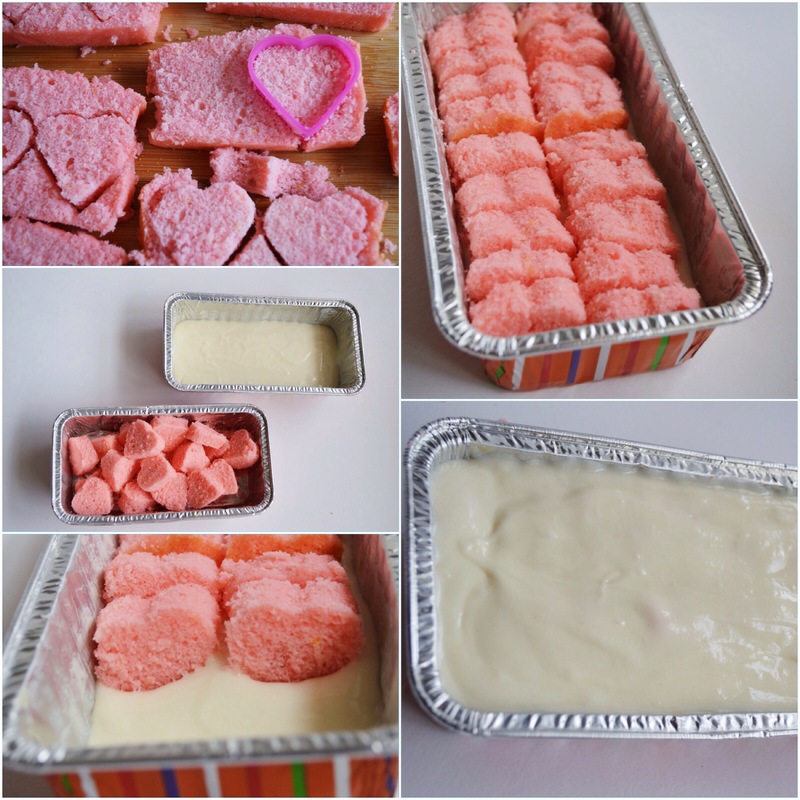 Spread a touch of the white cake batter to the bottom of greased 9×5 pan as a ‘glue’ to stick the hearts together. Carefully align the hearts. Then pour the rest of the batter on top of the hearts to cover them well. You may have more batter than required. Try not to overfill the pan. Bake according to the directions in box. Let cool. 1. Place chocolate in a large bowl. Heat 1 teaspoon butter and 1/2 cup heavy whipping cream in a saucepan over medium heat until butter is melted. Pour cream mixture over chocolate and whisk until smooth. Set aside until cooled, but still pourable, about 20 minutes. ✔️ If you want your heart to be darker, add more drops of color. ✔️ Instead of the box mix, you can make your own vanilla cake from scratch. I was too lazy to make one. I used betty crocker cake mix, which was extremely soft and moist. Mix up the white cake ingredients according to package directions. 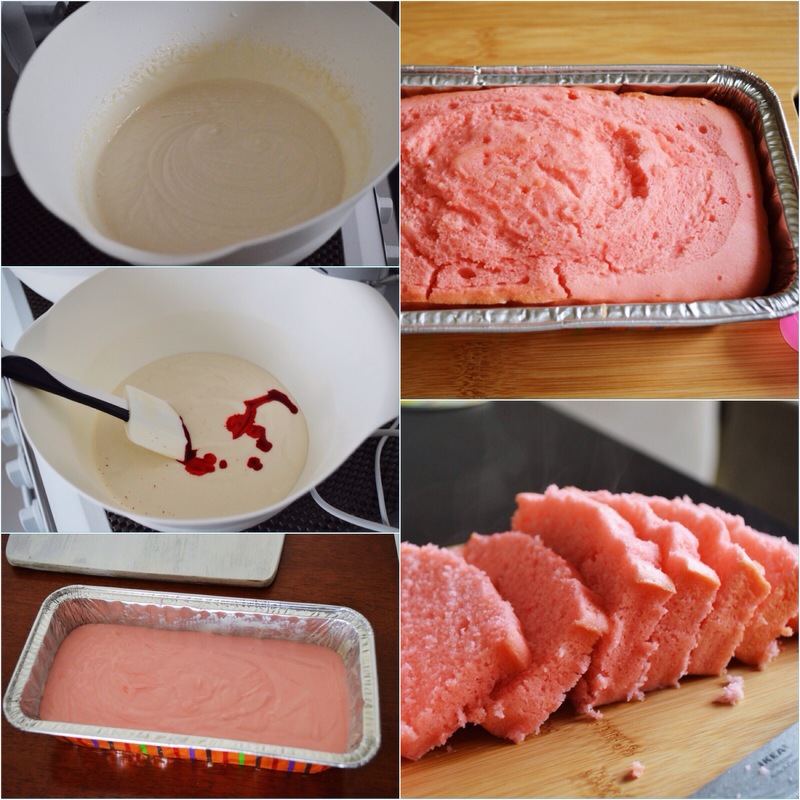 Take out 1/3rd of the batter out and mix in 3-4 drops of red food color to it. Bake it in a well greased 7×3-inch loaf pan. This might take a little less time than instructed. Remove from pan and let cool. Cut the cake into slices. Cut heart shapes from slices. 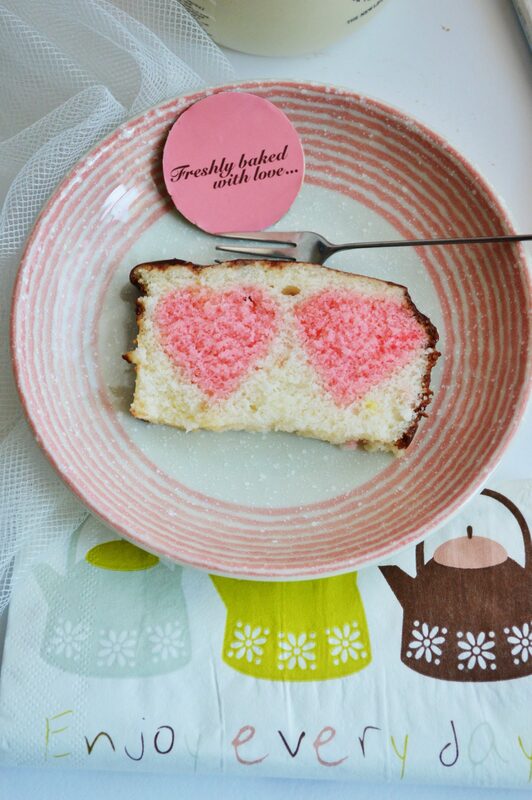 Spread a touch of the white cake batter to the bottom of greased 9×5 pan as a ‘glue’ to stick the hearts together. Carefully align the hearts. Then pour the rest of the batter on top of the hearts to cover them well. 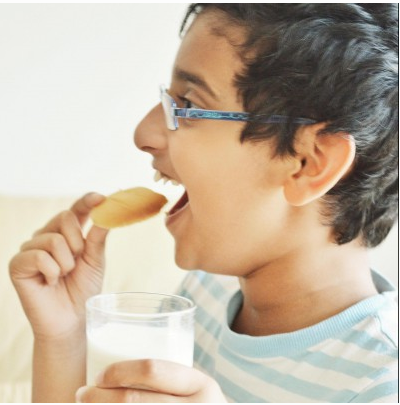 You may have more batter than required. Try not to overfill the pan. Bake according to the directions in box. Let cool. 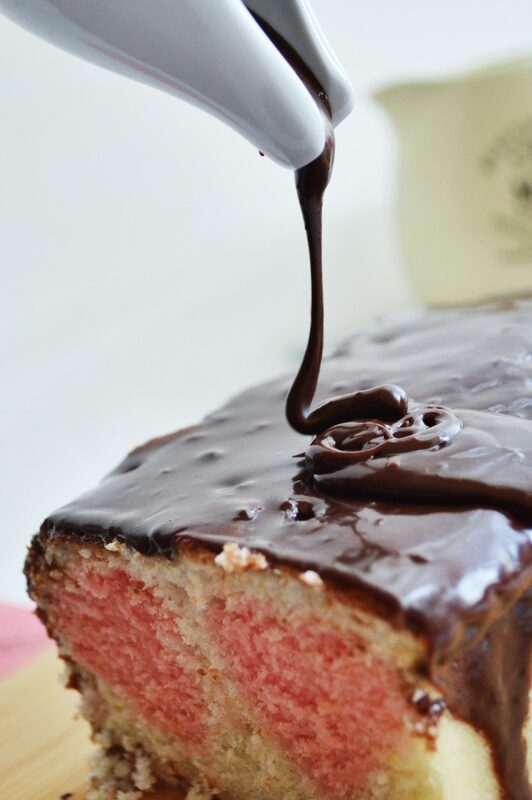 Pour the ganache over the cake and refrigerate it for half an hour. 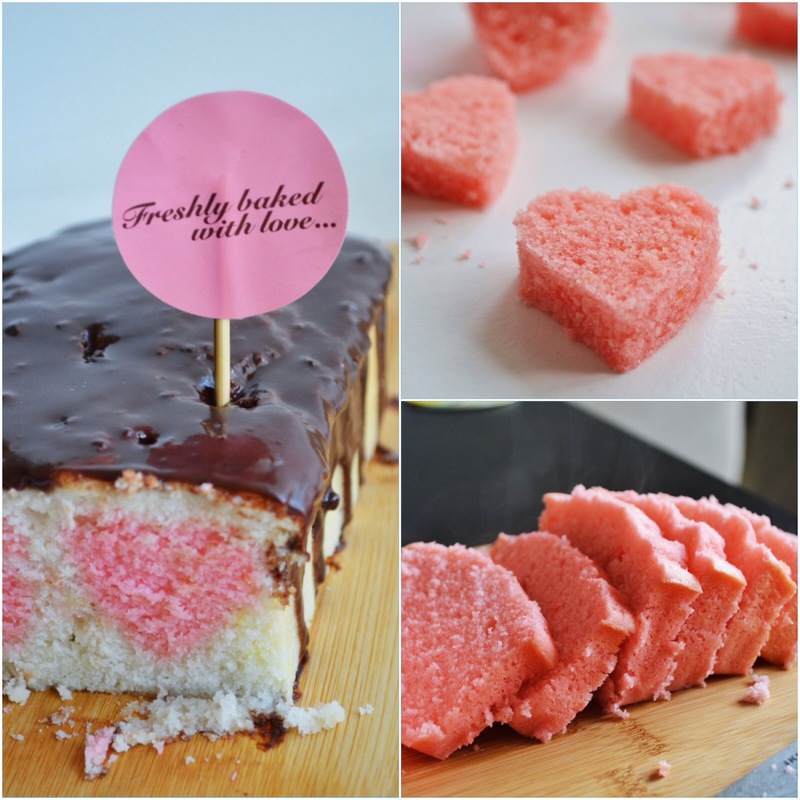 Cut into slices and delight your loved ones with the heart shaped surprise that peeks out from inside! That’s genius! And oh, I am seriously coveting your blinged fork!! That cake looks so cute! 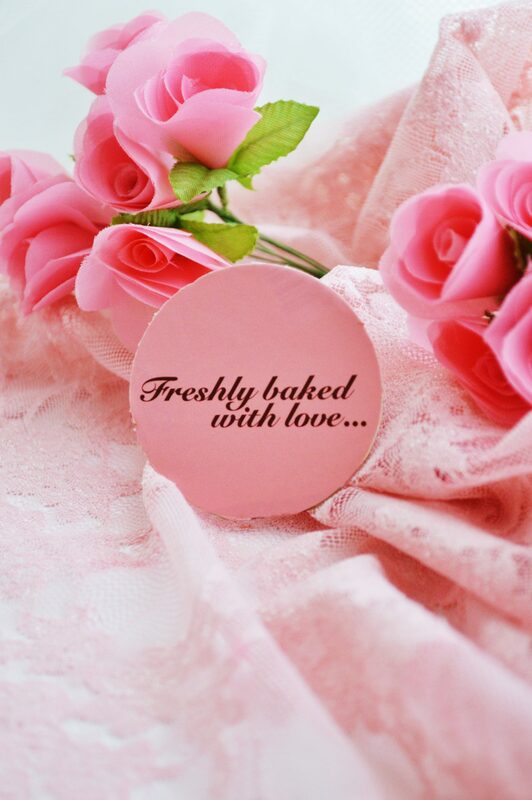 Oh that cake is so beautiful and really perfect for a Valentines treat. 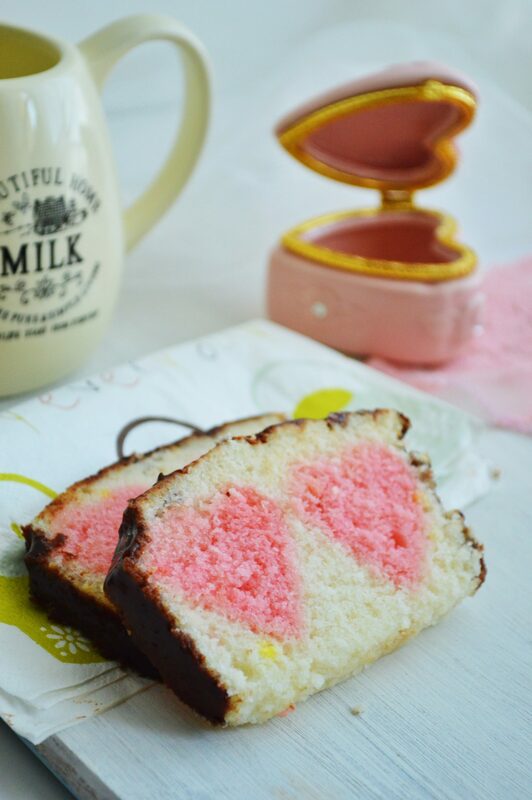 Ingenious how you got those pink hearts in the loaf. Happy Valentines Day! This is so pretty! I love the idea. Thanks so much for showing us how to do it. Your pictures are just beautiful! Happy Valentine’s Day! Happy Anniversary, before Happy Valentine’s Day! Just a lovely cake! Brilliant, Sadia! Awww indeed! 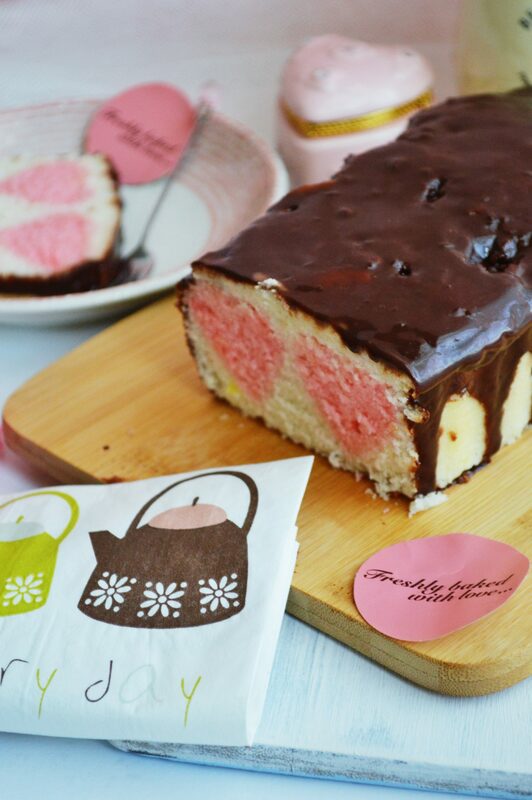 Lovely cake…I really must try this someday! That’s beautiful, Sadia! You’ve outdone yourself. Lucky, lucky Fadal! 🙂 Only kidding, I’m sure both of you are lucky to have found each other. Happy V day! Hahaha! Thanks a lot Angie! That’s great to hear, Sadia! That was the intent! 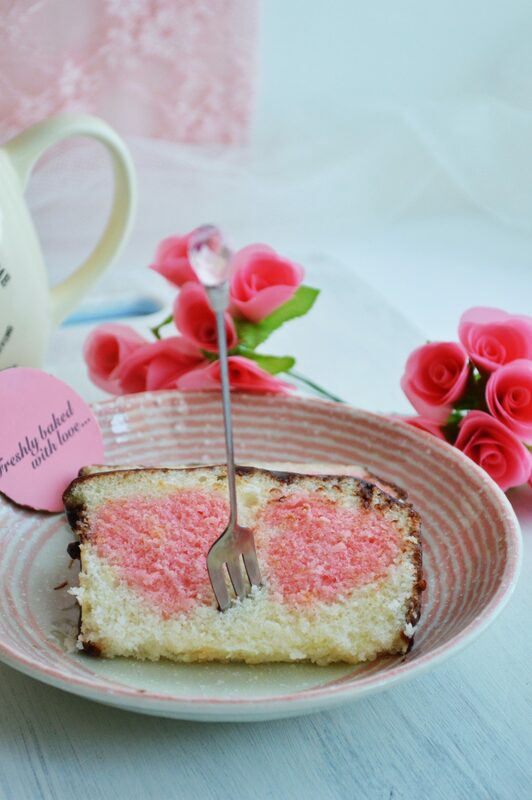 I’m not really into Valentines day but this cake is so cute! 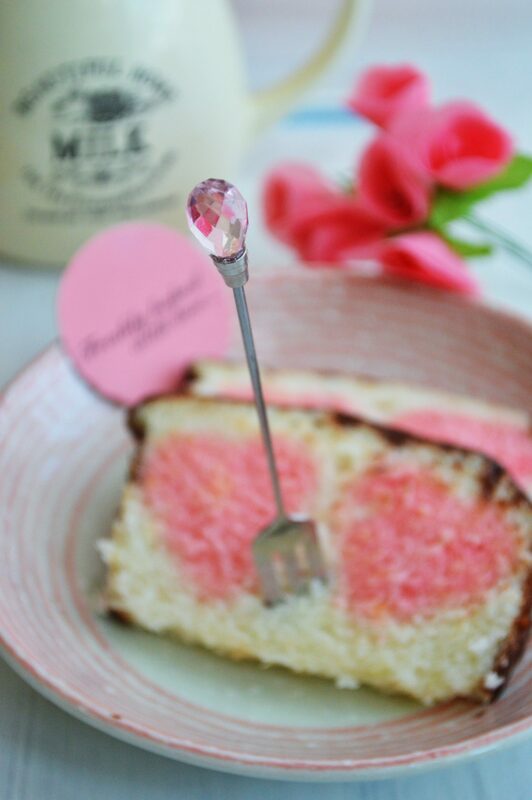 This is a gorgeous cake and a gorgeous post! You have a lovely blog. Thanks so much for bringing this for us on Fiesta Friday. Wow, your cake is almost too pretty to eat! Wow! 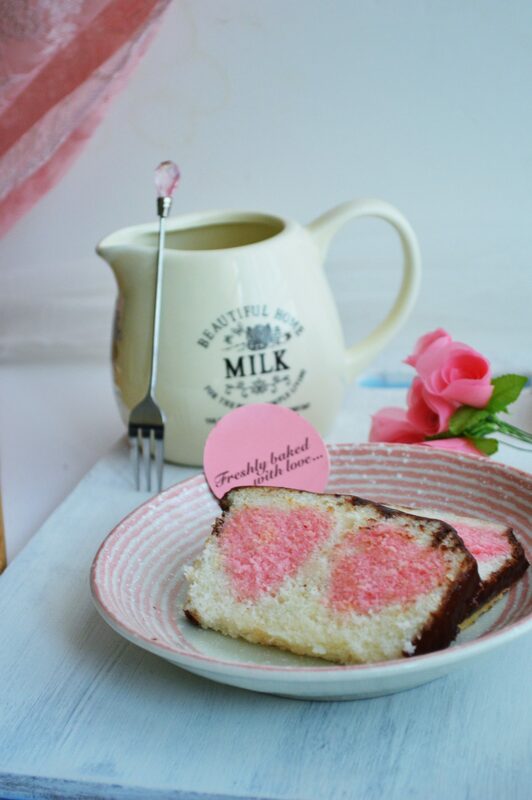 What beautiful photos and a delicious looking cake! I absolutely adore the way it looks so feminine and decadent! Yum! 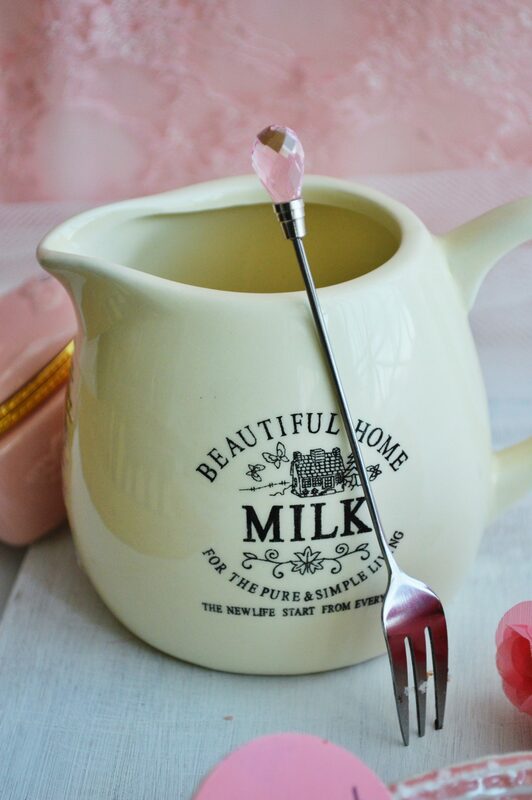 So girly and cute! So cute! 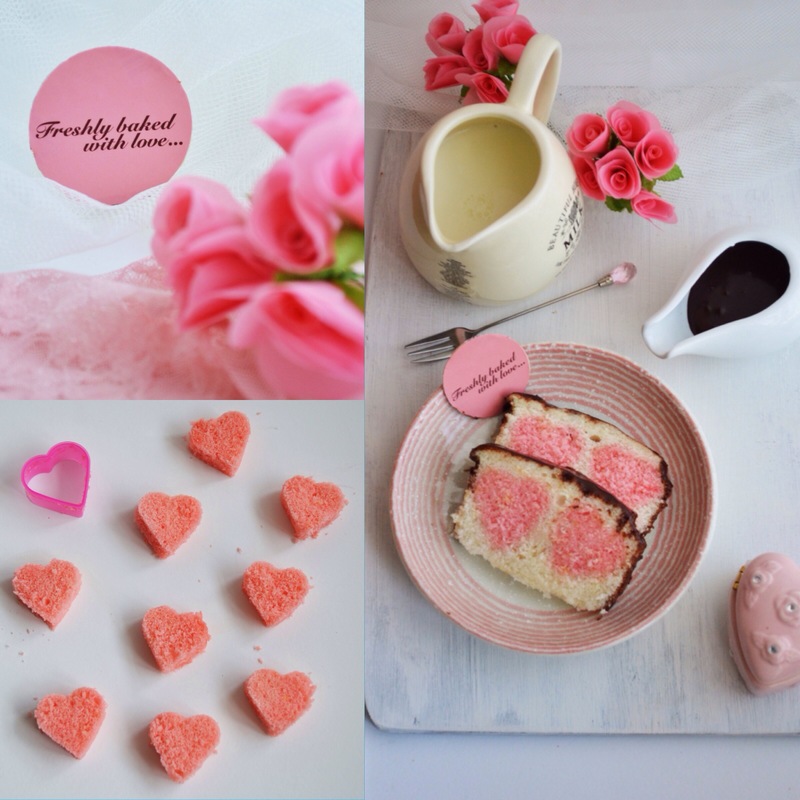 The pink heats are a great idea!